Before buying horsetail plant, ask yourself if you'd be comfortable having it pop up in places on your property where you hadn't planned on growing it, because that's what might well happen, despite your best efforts to restrict its spread. It's a moderately pretty plant, but you might end up resenting it as a weed unless you've come to grips with the reality that horsetail is designed to conquer. Equisetum hyemale is the botanical name for the plant known commonly as "rough horsetail" or "scouring rush." Its ancestors were gigantic plants in Paleozoic times. It's a perennial that is evergreen (although the green color will fade some during the course of a rough winter), but this ancient plant is more closely related to ferns than to the perennials we are most accustomed to growing in our gardens. A non-flowering plant, it reproduces via spores and rhizomes. Tall and skinny, you may hear it called "joint grass" (because of the horizontal bands that run across its stems) or "snake grass," but it's not a grass. In fact, the plant is not even related to grasses. It can, however, serve some of the landscaping functions served by ornamental grasses. Botanists point out that, technically, Equisetum hyemale has tiny leaves fused onto its stems. But the untrained eye notices only the attractive stems, which grow anywhere from 2 to 6 feet tall, depending on conditions. These stems are dark green at times (picking up some bronze color in winter) and hollow. Tiny ridges run vertically along the stems and contain silica, giving them the rough feel that earns the plant the common name, "rough horsetail." The stems, which are studded with nodes, largely owe their beauty to their striking black and cream-colored bands. Indigenous to North America (as well as Europe and Asia), the wild habitat for horsetail plants extends from planting zones 4 to 9. They're extremely adaptable in terms of light levels, growing in full sun, deep shade, and everything in between. In terms of moisture levels in the soil, they prefer (but don't depend on) a soil that's at least moderately wet; they can even grow in shallow standing water. Far from being fussy plants, you'll probably find that your challenge with horsetails isn't in growing them, but in containing them and keeping them from spreading to places where you don't want them to grow. Born colonizers, they have a strong tendency to spread and form a monoculture. That's why horsetail isn't for the feint of heart. Such talk often evokes the term, "invasive," but, technically, a species native to North America cannot be considered invasive in North America; that label is reserved for alien species that escape into the wild and begin to displace flora native to the region in question. It's more accurate (in a North American context) to describe horsetail plants as aggressive spreaders. Either way, unwanted horsetail colonies are difficult to get rid of, so be careful before you decide to grow this plant. Eradication is difficult due to its ability to grow back from the tiniest of rhizome fragments left behind in the ground, as with the dreaded invasive weed, Japanese knotweed (Polygonum cuspidatum). Consider growing horsetail plants in containers to minimize the chance of spreading (unless that's what you desire). If you'll be using them as a ground cover and wish to confine them to a particular spot, try to contain them using the sort of barrier that you'd use for bamboo (but there's no guarantee this will prevent the spread of horsetails). Speaking of weeds, another kind of Equisetum is field horsetail, also commonly called "corn horsetail" (Equisetum arvense). We can be comfortable categorizing this plant as a weed simply because it's every bit as aggressive a spreader as Equisetum hyemale, while lacking the redeeming aesthetic qualities of the latter. There are two subgenera of Equisetum, namely, the scouring rushes (an example of which is E. hyemalis) and the true horsetails (an example of which is E. arvense). Scouring rush is unbranched, whereas true horsetail bears many branches in a whorled pattern. Indeed, the branches of field horsetail give this weed the bushy appearance that invited comparisons to a horse's tail. But it's also reminiscent of the undersea plant, maiden's hair (Chlorodesmis). Many landscapes become overrun with this rhizomatous perennial. This often happens because a rhizome of field horsetail was hidden in some loam or fill that had been brought onto the property decades ago. Field horsetails will spread even under dry conditions. They lack the grace of rough horsetails, being shorter: At most, they will reach 20 inches in height, but you'll more typically find them (stunted, perhaps, by the dryness of the earth in which they grow) standing about 8 inches tall or less. Their color is also usually a shade of green lighter than that on E. hyemalis. Because of the rough texture that gives it one of its common names, rough horsetail has traditionally been used for scouring pots and pans. Meanwhile, alternative medicine experts suggest that field horsetail can serve as an antioxidant and that it can fight inflammation (an extract is commercially available, which you can take as a dietary supplement). Giant horsetail (E. giganteum) is a South-American native hardy only to zone 8b. Grow it in full sun to partial sun. Its selling point is that it can become 10 feet tall or more. Variegated horsetail (E. variegatum), by contrast, is a shorter (6 to 18 inches), hardier plant, being native mainly to the wetlands of the northern U.S. and Canada. It's termed "variegated" because its black-and-white sheaths (on otherwise green stems) show up better than those on E. hyemalis. Grow it in sun to partial shade. 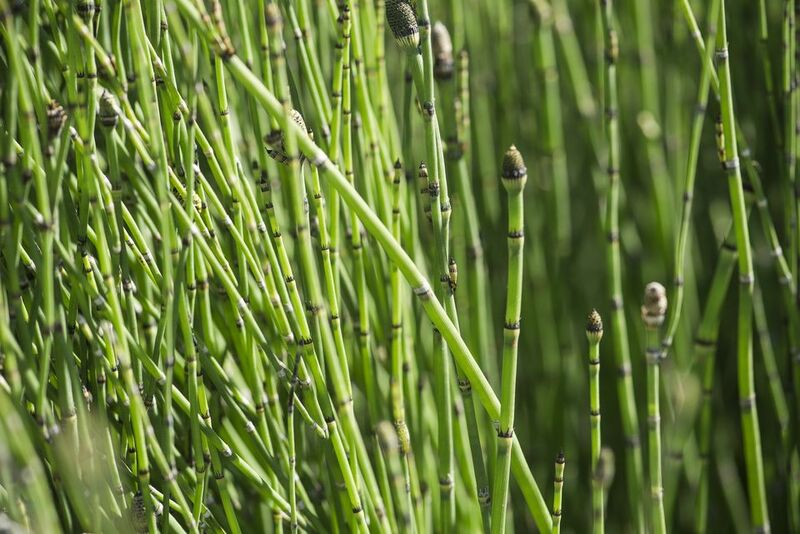 Equisetum breaks down into two Latin words, meaning "horse" and "bristle." Flora of North America explains this derivation as "referring to the coarse black roots of E. fluviatile" (which is one of the other kinds of horsetail). The species name, hyemale means "pertaining to winter" in Latin. The word sometimes takes other forms; for example, you'll often see it spelled as hiemalis. Apparently, this species name pays tribute to the evergreen nature of the plant and the consequent interest it can lend to the winter landscape. Finally, the species name, arvense, translates as "field" in Latin and perhaps refers to the fact that this weed is a common problem in farmer's fields.